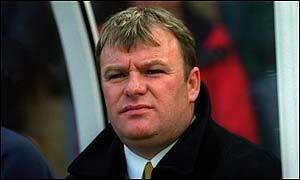 Former Boston boss Steve Evans could be banned from football for 20 months by the Football Association. The action would mark the end of an eight-month investigation into contract irregularities at the club. At an FA hearing in December, along with former Boston chairman Pat Malkinson, Evans was found guilty of impeding the enquiry. And a three-man FA panel informed both men of their punishments at a hearing in Birmingham on Wednesday. The FA has so far refused to confirm the exact nature of the punishments. But unconfirmed reports say Evans has been banned from football for 20 months and given an £8,000 fine. Malkinson has reportedly been banned from football for 13 months and has received a £5,000 fine. Both denied charges of impeding the inquiry but Evans had admitted four charges of contract irregularities. Evans, steered the Pilgrims to promotion from the Nationwide Conference to Division Three last season. The charges related to his involvement in the lodging of registered playing contracts containing details which were false. The men have four weeks to lodge an appeal. Links to more Boston United stories are at the foot of the page.